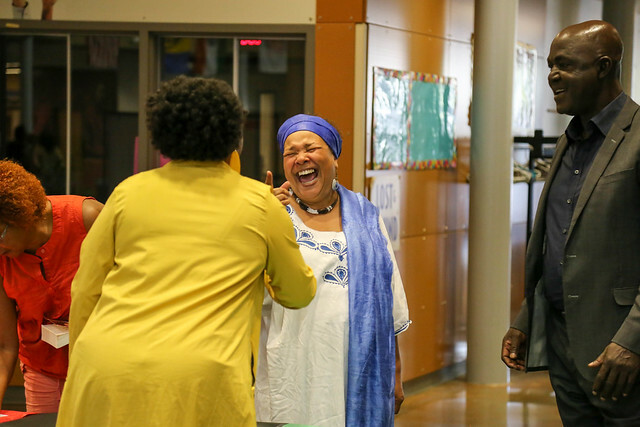 It is an honor to lead Seattle Public Schools. Since I started on July 1, I’ve been out learning all about my new community, our schools, and our students. I know that great things can happen in public education, but the work must be steeped in community. That’s why it was so important for me to take the time to learn from all of you. In September, I launched a comprehensive Listening and Learning Tour. My goal was to build a longer table, inviting new voices and perspectives to the conversation and intentionally engaging with families and students the district has historically underserved. I want to thank the many partners who welcomed me to Seattle and hosted many of the community meetings. Thank you for inviting me into your space and telling me your stories. I met with 2,500 people, representing parents, students, community partners, principals, educators, school-based staff, and central office. The tour was complemented by an online conversation, providing one more way for the community to provide feedback. Your ideas and perspectives are helping to shape our next strategic plan and they have certainly helped shape my thoughts about the district’s next steps. In January, we will be out again asking you for feedback about an initial draft strategic plan. In the meantime, I want to share back with you what I learned on the tour. Below you will find top priorities across all stakeholder groups and a final report provided to me by our strategic plan firm. You can also explore priorities unique to each stakeholder group and comments gathered during each Listening and Learning session. Thank you again for participating in my learning. I look forward to working hand-in-hand with our families, students, and staff to build solutions to our many challenges and a better future for our students. Together, we will make sure our students’ futures are bright, that they are successful, and they are prepared to live their dreams. Superintendent Juneau held 21 meetings with a variety of stakeholder groups across the city of Seattle from August 28 through November 15, 2018. In these meetings, attendees learned about the superintendent’s leadership journey, had an opportunity to ask questions, and were asked to fill out comment cards responding to the common question prompt. Staff collected these comments and translated into English, as necessary. Of the 21 meetings, 5 were held in a home language other than English and translation services were provided at all other meetings. Over 1,600 individuals attended the 21 community Listening and Learning sessions. Themes from these sessions can be found below. Read specific student priority themes and the report. Read specific family and community priority themes and the report. Listening and Learning sessions were held with SPS staff members from across the district including school leaders, school-based staff, support staff, and central office. Like the community meetings, participants were asked to provide their written response to the common question prompt on a comment card. More than 900 individuals attended 22 meetings. Themes from these sessions are included below. Read specific staff priority themes and the report. The district also implemented an online opportunity for staff, parents, and the broader community to share their thoughts to the common question, rate the thoughts of others, and discover what topics were most important to participants. The online engagement, ThoughtExchange, was open from September 17 through September 28, 2018 and, during this time, 1,660 individuals participated in some way. You can view a summary report of the online findings. Raw data from the online engagement was included in the final analysis and summary report to the superintendent. Racial Equity/Equity: Equity came forward as a strong theme, but while SPS has Board Policy 0030: Ensuring Educational and Racial Equity, which identifies “eight commitments to the success of every student in each of our schools”, there appears to be an inconsistent understanding of the commitments in the policy, variation in how equity is defined, and a wide range of viewpoints on what SPS should prioritize in order to address existing equity challenges and gaps. Inclusion and Meeting the Needs of All Students: There is an opportunity to support teachers, administrators, and staff in better understanding and meeting the needs of all students across the district including, but not limited to race, gender identity, sexuality, home language, and learning needs and create more inclusive and welcoming environments that support student success. Dual Language and Heritage Language Access: There is a deep appreciation of and belief in Dual Language immersion programs from those students, families, teachers, and administrators who have been able to be involved with them. Improvements in Special Education: There is a perception that there is high variability in the quality of Special Education services and instruction across Seattle Public Schools. Enhanced Student Supports: Increasing complexity of student needs across the district require more intensive and targeted supports and counseling, especially in the areas of social-emotional wellness, mental health, trauma, and homelessness. Improved District Core Operations: There is a clear desire for more consistency and predictability from core district operations so that students, families, and school staff can plan for and deliver high-quality instruction. This includes school staffing, especially once the school year begins, transportation, food services, safety, and cleanliness within buildings and on school grounds. Community Partnership Alignment: There is an opportunity to develop or improve partnerships with community organizations and Seattle city agencies to strengthen ongoing communication, feedback, and better utilize resources available to students and families through these partnerships. Parent fundraising varies considerably across schools, which has resulted in equity concerns from many stakeholders. However, there are different opinions on the extent of the challenge and potential solutions. Enrollment in the Highly Capable Cohort (HCC) don’t reflect district-wide enrollment patterns. There are a wide range of viewpoints regarding the root cause of this discrepancy and ideas on what the district should consider in response. In addition to the priority themes, the community appreciated the opportunity to speak directly with the superintendent and expressed a desire for this practice to continue. The full Listening and Learning Tour Report provides additional information and includes how the data gathered was analyzed. Findings from the Listening and Learning Tour have been provided to Superintendent Juneau, partners that hosted the tour, and members of the strategic plan steering committee. While findings from the Listening and Learning Tour won’t be the sole input into the strategic planning process, it will be a foundational component. In January 2019, staff and the strategic plan steering committee will be sharing back to the community a focused set of priorities, goals and strategies. To learn more, please visit the strategic plan development webpage.